The Everything Girls Ultimate Body Art Book features over 50 lessons that show you step-by-step how to draw cool doodle tattoos! 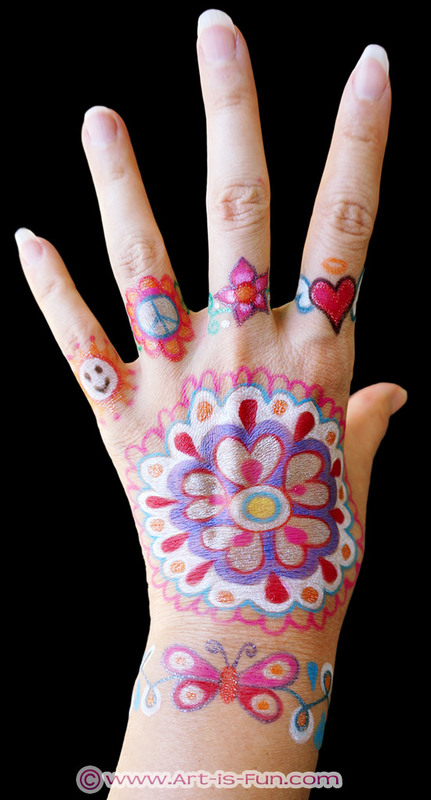 Using tattoo markers or pens, or makeup such as eyeliner, you can create awesome temporary tattoos on yourself or your friends. Body doodles are a fun way to show the world your creative side! This 128-page book was written and illustrated by me, Thaneeya McArdle. On this page I'll tell you more about my book, and show you some of the body art I created by following my own lessons... like this hand and wrist tattoo, which I created by combining several lessons! To create the colorful temporary tattoo above, I followed my Butterfly Bracelet Lesson on page 26 to draw the design on my wrist; my Chic Flower Lesson on page 43 to create the design on the back of my hand; and my three ring lessons on pages 20-23 to create the flower, peace sign and heart rings, then I improvised the smiling sun ring on my pinky. You can draw body doodles just about anywhere you can reach - the most common areas being hands (fingers, palms and wrists), arms, legs and ankles. Let your body be your canvas! Doodle Jewelry -This chapter starts off with tips and ideas on shapes and patterns, plus 3 step-by-step lessons on how to draw cool patterns. You'll find 3 lessons on creating rings, 3 lessons on bracelets, and 3 lessons on necklaces. Mini Abstract Doodle Tattoos - Abstracts are super fun and easy to create, because anything goes! 15 step-by-step lessons in this chapter show you how to draw 3 flowers, 3 starbursts, 3 mandalas, 3 paisleys, and 3 hearts. Cute Food Doodle Tattoos - Satisfy your sweet tooth by doodling delicious goodies! 7 step-by-step lessons demonstrate how to draw a cupcake, strawberry, doughnut, ice cream, frozen yogurt, ice cream sundae, and a lollipop. Animal Doodle Tattoos - Show your wild side by doodling cute animals! In this chapter you'll find 6 easy step-by-step lessons on how to draw a butterfly, owl, sitting cat, fish, snake and flying cat. Let your inner animal roar! Sugar Skull Doodle Tattoos - Celebrate Mexico's most famous holiday, Day of the Dead, by drawing sugar skull tattoos! This chapter starts by showing you how to draw a skull outline, followed by 4 step-by-step lessons on how to decorate the skulls with flowers, peace signs and more! Henna Tattoo Doodle Designs - "Henna" is a dye created from the henna plant, which is used by many cultures around the world to create elaborate temporary tattoos that often cover a person's whole hand (and other body parts, but in these lessons we focus on hands). This chapter includes 9 step-by-step lessons on how to draw finger designs, wrist designs and palm designs - and how to combine them to decorate your whole hand! The images in The Everything Girls Ultimate Body Art Book are printed in shades of magenta and black as shown above, but as you can see in my real-life examples on this page, you can use any colors you can get your hands on to create colorful, whimsical body art! In addition to the step-by-step drawing lessons, at the end of each chapter there is a "Doodle Your Own" section filled with half-started images that you can finish yourself, by doodling right in the book or copying the images onto your own paper. This section is designed to jumpstart your creativity, to help you design your own tattoos with your own personal twist! I drew a sugar skull (p.104) on the inside of my wrist and a heart bracelet (p.25) beneath it, using colorful eyeliner and tattoo gel pens. 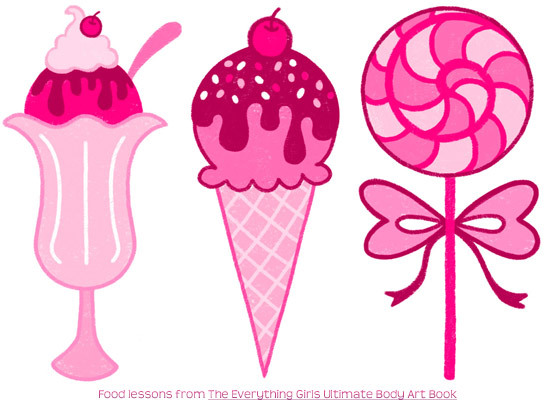 The Everything Girls Ultimate Body Art Book is marketed towards girls between the ages of 9 - 13. Drawing temporary tattoos is a fun, creative activity for parties and sleepovers, as well as doodling solo (and surprising everyone with the results later!). Although this book is meant for girls, it can also be fun for folks of any age or gender who are interested in easy step-by-step drawing lessons that you can customize with your own colors and patterns. This book is designed for beginners so the steps are easy to follow - no drawing skills necessary! What can I draw with? Tattoo pens and colorful eyeliner can be purchased on sites like Amazon, often available in inexpensive sets. Also check the makeup aisle and arts & crafts aisle in stores like Walmart and Target. Crafts stores like Michaels and JoAnns also tend to carry kid-friendly makeup and body art supplies. Grocery stores and drugstores also carry a wide range of makeup, and all of these stores usually have more interesting (colorful!) offerings during Halloween. For the examples on this page, I used a set of colorful eyeliners and tattoo gel pens that I purchased from Amazon. IMPORTANT: Remember not to use ordinary markers or glitter pens for body art, as many supplies contain chemicals that aren't good for your skin. There are a lot of easily obtainable body art supplies available so always choose products that are meant to be used on skin. For cleanup, moist wipes are perfect for wiping makeup off your skin, as sometimes soap and water is not enough to get off all the color. Moist wipes can be easily purchased at grocery stores, drugstores, etc. In essence, The Everything Girls Ultimate Body Art Book is a book filled with easy drawing lessons, which means you can draw the images on paper too, not just your skin! I actually suggest practicing on paper first, to get a feel for how each image is created and how it might look when finished. You can also experiment with different color combinations and patterns. Feel free to change anything you want in the lesson to make the drawing your own! Learn how to draw these shooting stars on page 52! You can also ask for The Everything Girls Ultimate Body Art Book at your local bookstore! If they don't have it in stock, they can probably order it for you and have it shipped directly to your address or give you a phone call when it comes in. Here are a few more examples of body art tattoos that I drew on myself, following the lessons in The Everything Girls Ultimate Body Art Book! Learn how to draw this butterfly bracelet on page 26! The example below shows that you don't need a bunch of colors to draw doodle tattoos... you can make cool tattoos using just one color! 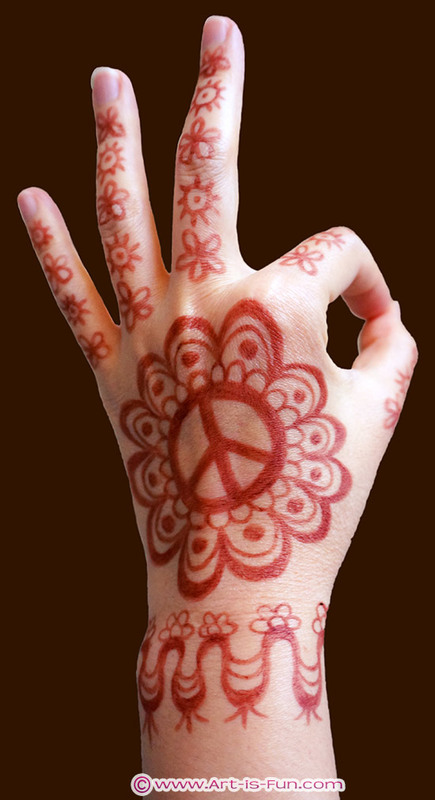 Learn how to draw this henna hand design in Chapter 6! In the example below, I covered my arm in doodle tattoos from several lessons in The Everything Girls Ultimate Body Art Book. In the top row, I followed the pattern lesson on page 17 to create a row of raindrop shapes. Beneath that, I drew the groovy star pattern demonstrated on page 18. Below the stars, I drew the chic pattern from the lesson on page 19. The next design is a flower bracelet, which you can learn on page 24. The bottom image, a giant peace sign flower, was actually drawn from my "Peace Flower Ring" lesson on page 22, but I decided to draw it large on my arm instead of as a ring. This example shows that you can draw these lessons anywhere - the rings don't have to go on fingers, the bracelets don't have to go on wrists - they can go anywhere you want! To draw these temporary tattoos on my arm, I used a set of colorful eyeliners that I purchased from Amazon. I washed them off using moist wipes (the kind meant for skin, not household cleaning). If you make a purchase from Amazon or Book Depository after clicking one of the links on this page, I'll receive a small percentage of the sale as an affiliate commission. Thank you in advance!